Wondering what to wear as the warm sun begins to peek out from behind the clouds? The simplest answer is a statement dress. Whether in a bright floral or a bold graphic print, a statement dress is a one-piece solution to any springtime wardrobe dilemmas. 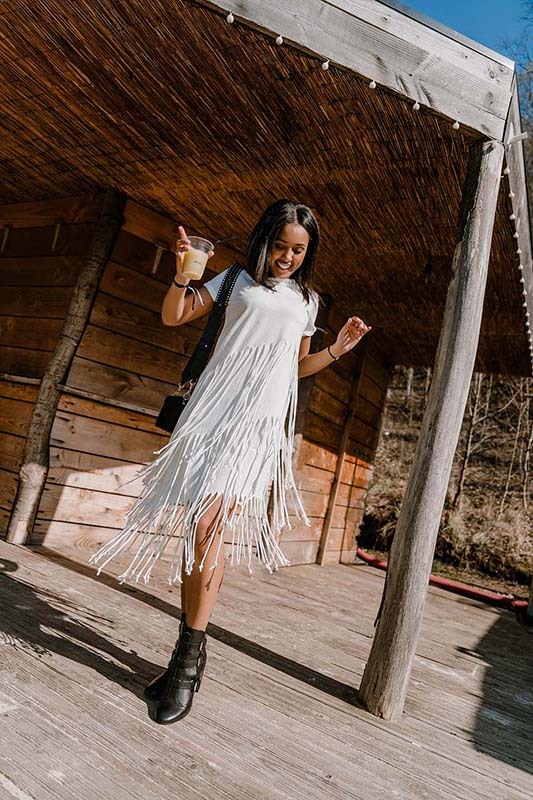 With these eye-catching frocks from brands like All Saints, Scotch&Soda and Sandro, you will feel put together while putting in a minimal amount of effort. Hurray for Spring! Liven up the office with a breath of fresh air in the form of a bright, spring-ready dress that will leave you feeling inspired! Karen Millen is known for her elegant designs that leave you feel polished and confident at all times. This pink dress puts the fun in ‘office appropriate dressing’. 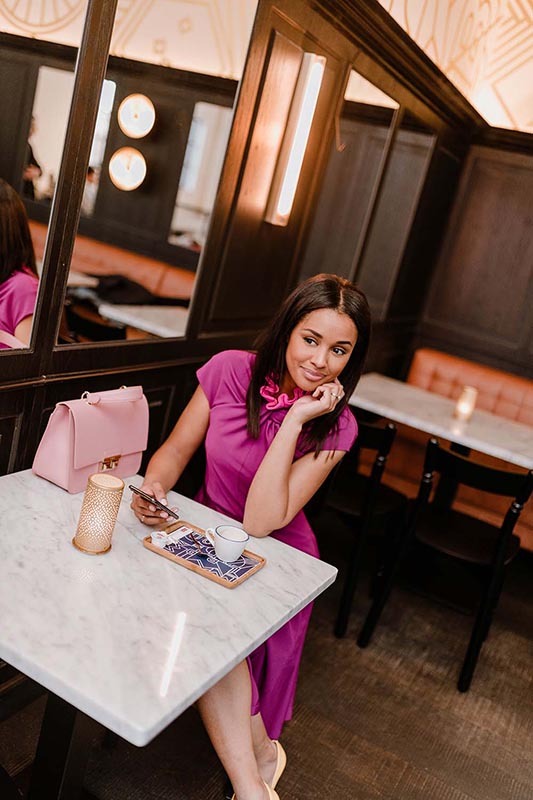 The playful collar and cute sleeves are the perfect solution to not showing too much skin, while the dashing pink color puts you in the center of attention. Go make those deals, lady! Spring is the season for laid-back looks. Whether you are meeting your family for brunch or enjoying a shopping spree with your bestie: a casual day dress will have you covered on your days off! These Ted Baker-dresses combine comfort with style. The detailed sleeves and collar are the perfect accessories on a day that you don’t feel like accessorizing much, while the pastel hues make you look effortlessly feminine. A winner! If you’re a fan of a feminine style, nothing says Spring quite like a pretty floral dress. Floral prints and Spring season are synonymous to each other. Florals add a delicate feminine touch to your look - with a hint of romance in the air. These flower print maxi dresses from Sandro and Twinset make you look like a princess in the sunny season! Just add some high heels, bohemian-like earrings and a waist-enhancing belt or shrug to your look and you’re good to go until Summer! Unleash your inner hippie with a bohemian-inspired maxi dress. Thanks to its breezy silhouette, an extensive range of prints and a wide spectrum of colors, a maxi dress is a true favorite this Spring. These colorful, sweeping frocks from Ba&sh and Scotch & Soda will help you keep up with the bohemian vibe. Style them with an elegant straw hat and metallic sandals to give your look a street-chic appeal for a city stroll. From cocktail hours to holiday parties: Spring season brings plenty of occasions to get your glam up! Add some sparkle to your wardrobe with this stunning sequin Armani cocktail dress. Want to keep it a bit more low-key? Then opt for this curve hugging little black dress by Versace: a classic that never goes out of style. Pair it with the sequin Armani blazer to step into the limelight – but also step out of it when you feel like it. It’s time to talk festival fashion! No matter which music festival you attend this season, the one thought your mind is “what the heck do I wear? !” We have the answer for you: this white frill dress by All Saints. Comfy, modern and cute, this white frock will keep you cool and ‘cool’ throughout the festival. Accessorize your look with wavy, beach-like hair and some edgy boots and there you have it: a festival look that will surely not miss a beat.